(Lemoine, 1906) Heirloom. Lactiflora. Full double, soft pink flowers with edging a little lighter that the inside. This double pink has stood the test of time and continues to perform as gorgeously scented pink and has always been a favorite in the cut-flower industry. A few petals show crimson edges; may need some support in the garden landscape, but these gorgeous flowers are well worth it. Late bloomer. (Smirnow before 1948) Lactiflora. Blush, double, light fragrance, midseason, 34" tall. The color is a beautiful light blush pink which changes into white. An	outstanding variety as a cut flower for its firm stems and early	flowering period. (Klehm, 1968) Lactiflora. Bomb type; center ball is creamy white with raspberry pink over the top, mild fragrance. Reminiscent of scoops of vanilla ice cream with raspberry topping. Vigorous grower, medium tall with flexing stems. Recommended as a cut flower. A long-time garden favorite. (Falk/Glasscock, 1956) Hybrid. Scarlet O'Hara's large single flowers open a red-pink and fade to pink as she ages. Pink stigmas, green carpels and yellow stamens. At the center is a gorgeous tuft of yellow stamens to provide accent. Plants are on the tall side (40") and grow with tremendous vigor. Stems are sturdy and foliage is a nice dark green. No fertility. APS Award of Landscape Merit. (Klehm) Hybrid. Unusual blend of very soft, creamy cherry pink with a hint of pistachio at the petal base. The slightly serrated edges of the guard petals add extra interest to the blooms. (Klehm, 2003) Lactiflora. 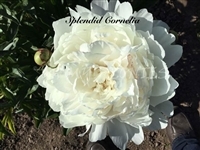 Large, pure white blooms with outstanding large round, guard petals. Deep red-tipped stigmas. 28" tall holding 6" wide blooms Star Power has 3-4 buds per stem. Slight fragrance and has stamen, pollen and seeds. (Klehm, 2003) Lactiflora. Blush double bloom. This is a very nice 23" bush that produces midseason flowers that are sized 6" in diameter. A beauty when cut and allowed to mature in the vase. Has stamens and pollen. (Bigger, 1975) Lactiflora. This deep red color peony on its 36 inch stems creates quite a stand-out in the garden. With it's layers of petals and small tufts of stamens, it maintains it's color very well. An eye-catcher and worthy of your planting. 2012 APS Gold Medal. (Glasscock, 1944) Hybrid. Gigantic double bomb of deep crimson red with a multitude of petals piled high in the center. Slight clove fragrance. Blooms early and stands 32" tall. APS Gold Medal Winner, 1956. This peony truly stands out in the garden and has been considered a top winner at shows! (Reath, 1992) Hybrid. Early blooming. Brilliantly ruffled with red petals with 3 or 4 rows of ruffled guard petals which seem to float in the breeze. 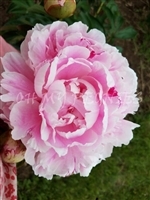 Fragranted, this peony is very fertile as both a pod and pollen parent. 2013 APS Gold Medal.